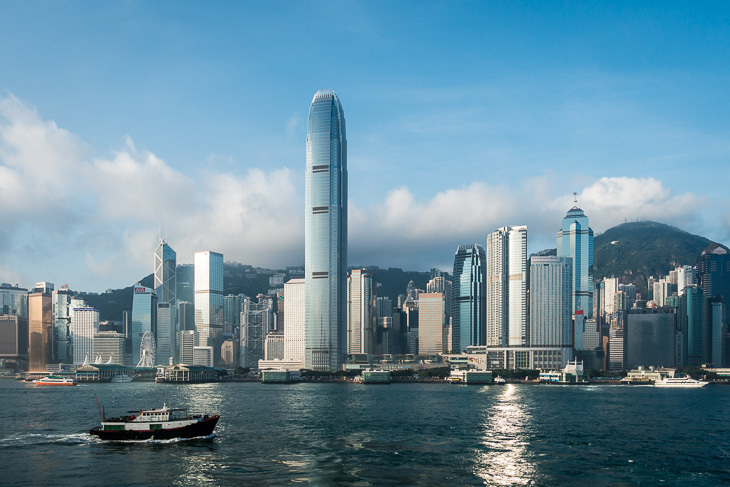 Did you know that Hong Kong has almost twice as many skyscrapers as New York City? Hong Kong is an ancient city, but it’s also a well-established, busy confluence between China and the rest of the world. Twenty-two years ago we took the cable car to Victoria Peak, then walked the steep descent back to town. Our physical condition must not have declined too much, because this time we did the five-km walking trail that encircles the summit in addition to the one-hour descent to the cruise ship. Pedalling a bicycle-built-for-two is not as easy as it looks, especially when the bicycle is designed for riders with legs much shorter than ours. Xiamen (sounds like Sha-men) has been a major seaport since ancient times. 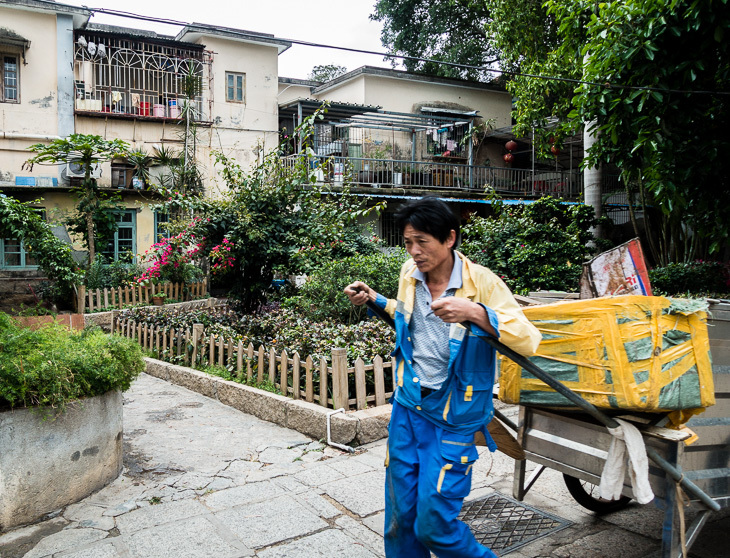 For our first day in this island-city we chose a tour called A Taste of Local Life in Xiamen. The day began with a wobbly cycling ride along Island Ring road, enjoying the sea view. 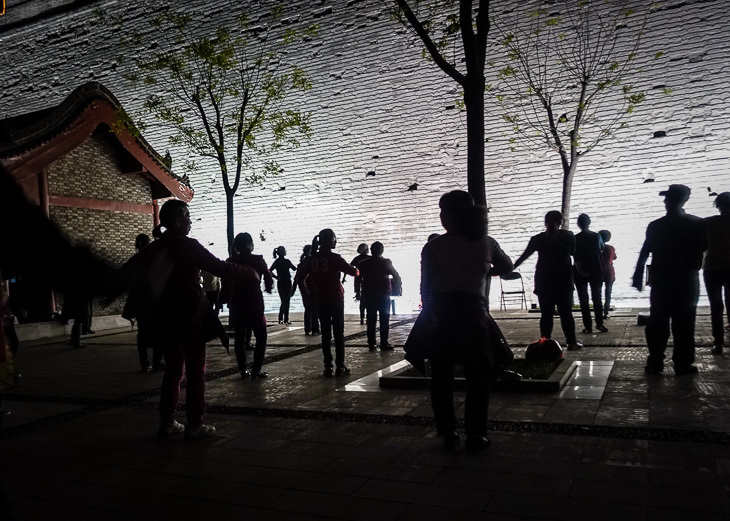 A traditional Tai Chi class was the next activity, during which the Tai Chi masters demonstrated various ways to create harmony between one’s inner and outer bodies. Next came a visit to a tea house, where we learned how to prepare several varieties of Chinese tea. Dr. Tea claims that Chinese tea will lower cholesterol, improve eyesight, eliminate worries, stop snoring, and relieve freckles. In spite of these benefits, we are sticking with coffee. English is of little or no use in Xiamen once you step away from the tour bus. Oceania provides its passengers with a lifeline: a card showing the name and location of the cruise ship in Chinese characters – perfect for showing to a taxi driver or a friendly passerby. With that little card in hand, on day two we made our own way to and from Gulang Yu, a tiny island that attracts droves of visitors who come to tour the winding back lanes, colourful colonial villas, fragrant flowers, and ancient banyan trees. Food shops serve the local specialties: shark fish balls, sand worm jelly, and sea stars on skewers. The bulldozers are busy, but behind the scenes there are glimpses of the Shanghai that Phileas Fogg visited in Around the World in 180 Days. The Bund is the most famous mile and the tourist centre. This waterfront promenade has elegant art deco heritage buildings on one side. Across the river is an immense business zone with futuristic skyscrapers and non-stop shopping. 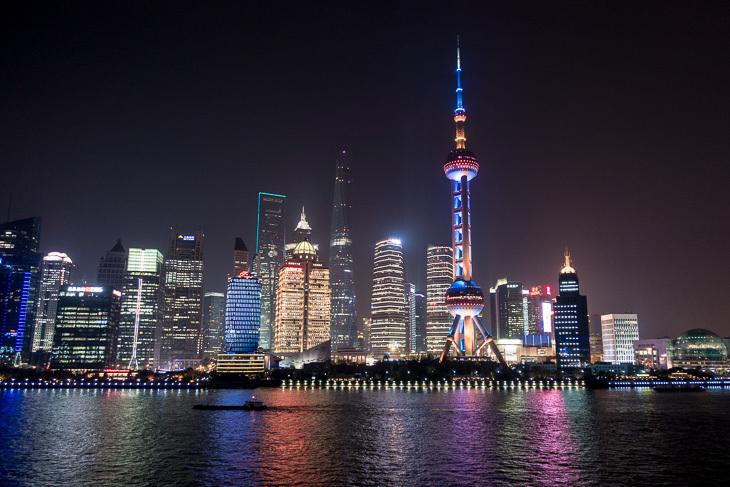 With a population of 23 million, Shanghai is one of the largest cities in world. 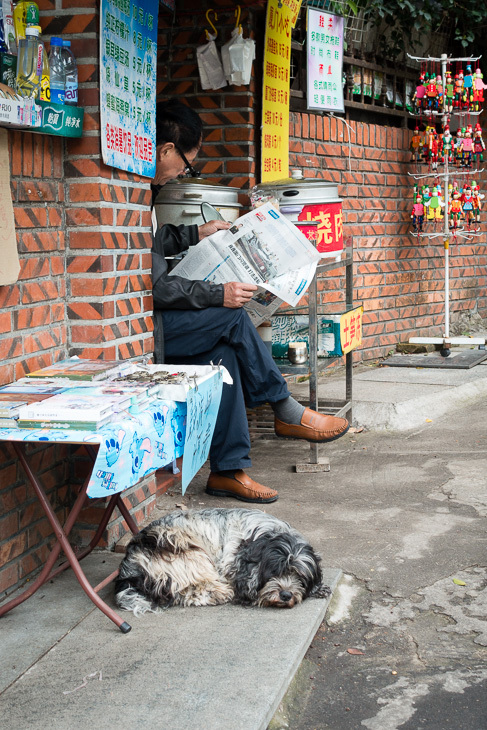 Surprise: Shanghai is walkable, clean, orderly and sophisticated. In People’s Park matchmakers gather every weekend to find mates for men and women who are too busy (or unwilling) to search for husbands and wives on their own. Agents post resumes on one side of the walkway, parents and grandparents on the other. The matchmaking path was one of the stops on our Mighty Ride, a four-hour motorcycle-sidecar tour of the city we arranged through a company called Shanghai Insiders. Simon, our insider/guide/driver, is originally from Switzerland. 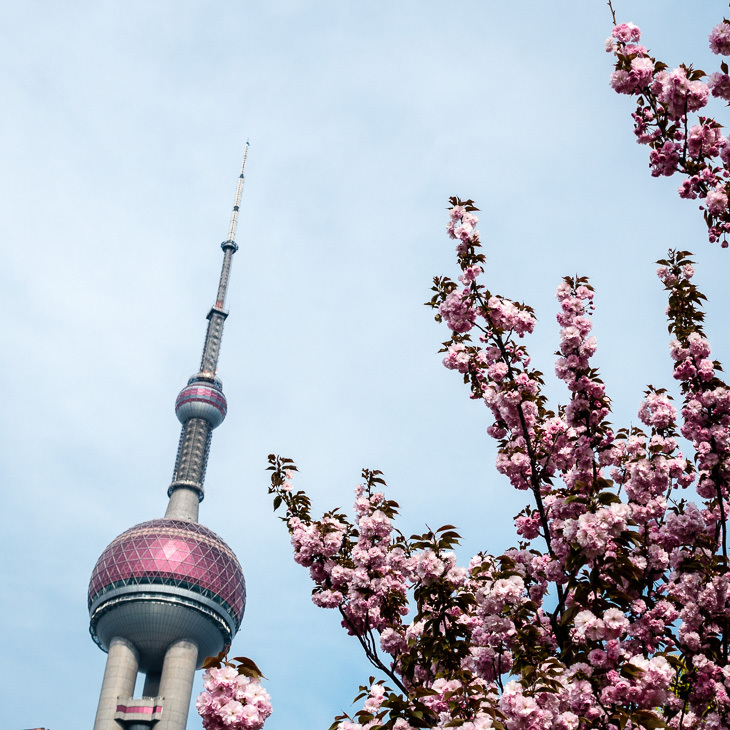 Simon has lived in Shanghai for seven years, and his knowledge and love of the city were evident. 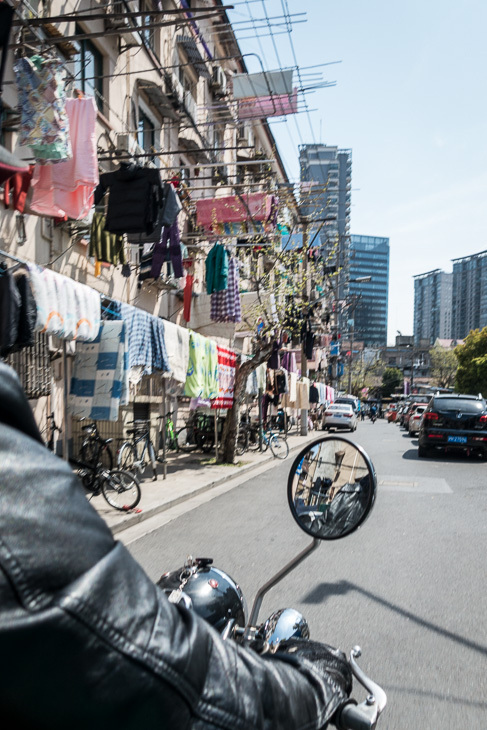 A former slaughterhouse, the leafy Former French Concession area, and the Old City with its Chinese narrow alleys and bazaars were other stops on our motorcycle-sidecar tour. 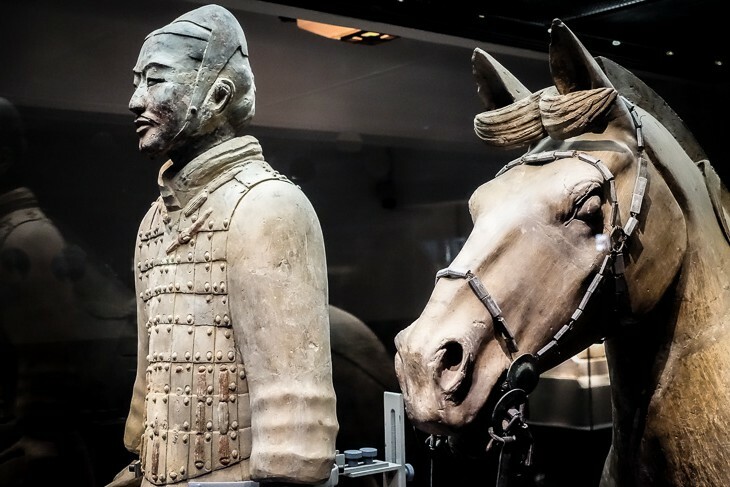 Eight thousand life-size warriors and horses lined up in battle formation – no two of them alike. 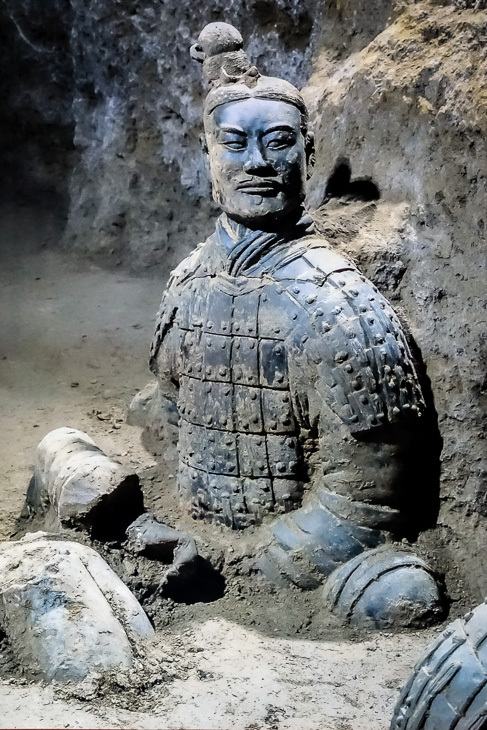 These clay soldiers were buried with China’s first emperor to accompany him in his eternal rest. Buried for centuries, this astonishing underground army was first excavated in 1974, after a lucky farmer unearthed fragmented warriors and bronze weapons while drilling a well. 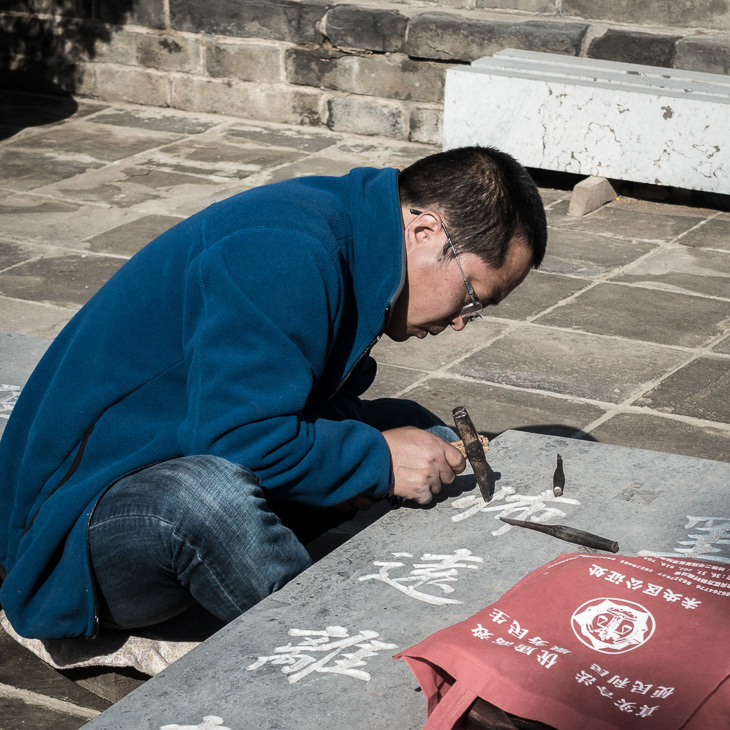 The Terra Cotta Warriors is one of the world’s most famous archeological sites. If not on your bucket list, it should be! 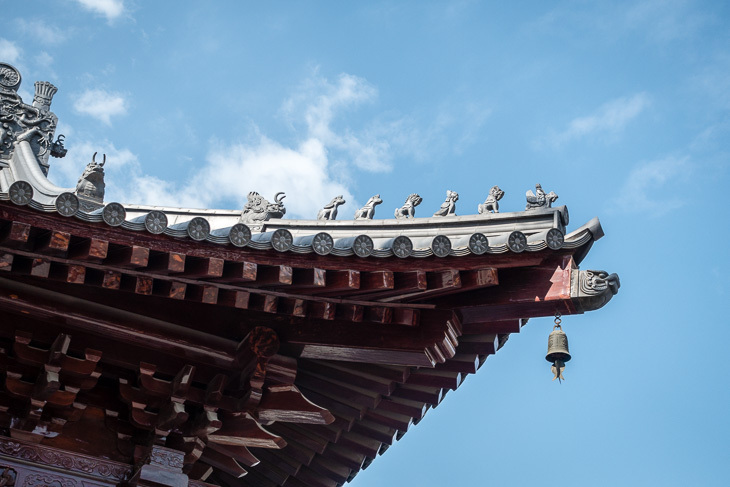 The City Walls and Big Wild Goose Pagoda are other Xi’an sites. Constructed in 1370 during the Ming Dynasty, the City Walls stretch around the entire old city for nine miles, with 98 ramparts. Allow four hours to walk or ninety minutes to cycle the entirety of the walls, and come back at night to see the lights. Big Wild Goose Pagoda has a great open-air public space, where locals were enjoying kite-flying and family gatherings. Mao Zedong said “he who has not climbed the Great Wall is not a true man.” Now we can claim to have climbed the Great Wall (one hour up, fifteen minutes down), although we didn’t purchase one of the souvenir certificates. 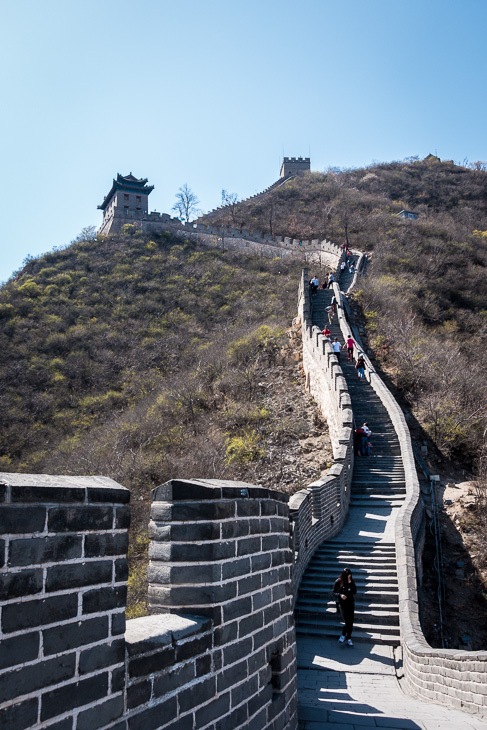 As most people know, the Great Wall is an engineering triumph, built in the 3rd century to protect China’s northern border from foreign invaders. We asked about climbing the Wall end-to-end, but it’s not possible: the Great Wall is discontinuous, and many surviving sections are unsafe. 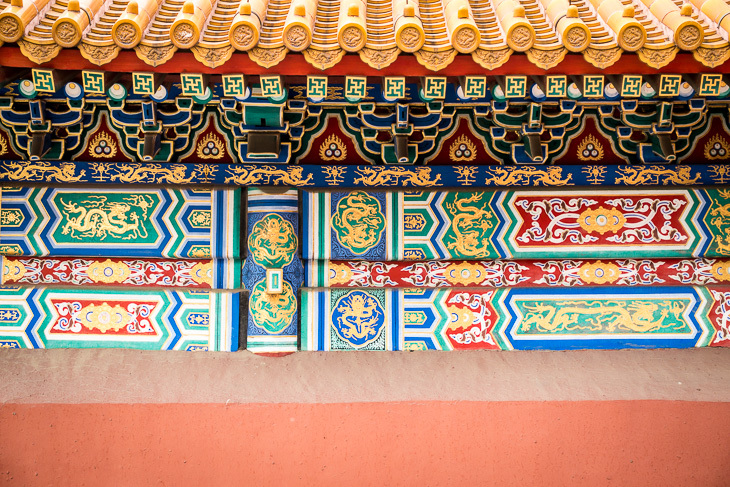 Tiananmen Square and the Forbidden City were our final stops in China. The most memorable feature? The people. People everywhere, and this was just an average visitation day, according our guide Wei. 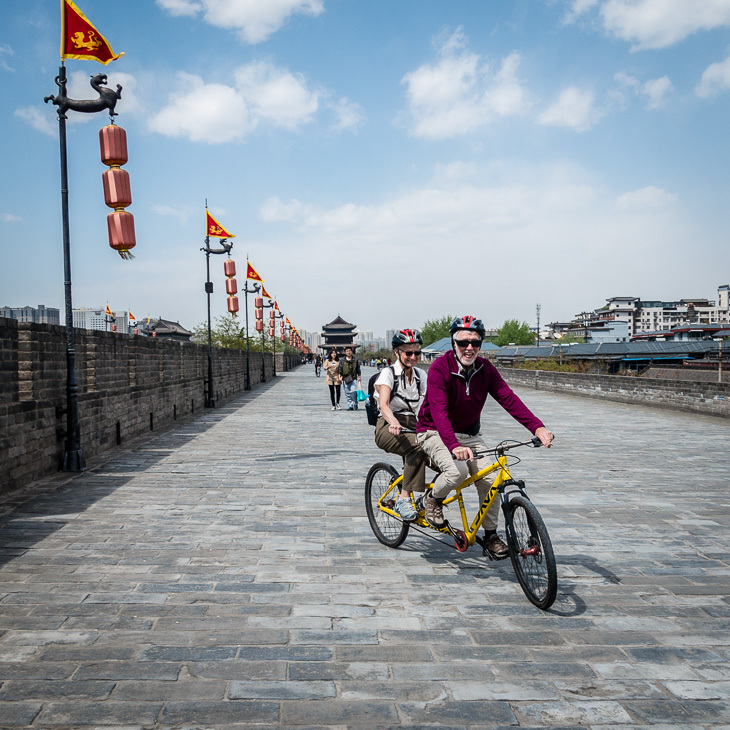 This entry was posted in Asia, Bikes, Boots, China, Cruise, Hong Kong and tagged Beijing, Shanghai, Xiamen, Xi’an. Bookmark the permalink. Seeing famous sights and getting plenty of exercise. Good going! We think the Terracotta Warriors are our favourites so far. Hi Doug and Cathy, just getting caught up with your adventures – having come home from my Hawaiian cruise (not as eventful as yours). Keep up with the good writing and get Doug to do more colour commentary. I walked the whole 14km Xi’an City Wall in 2007. At times it seem it was the loneliest place in China! Quite an experience. Thanks for writing, George. We were going to bike around the wall, but only had enough time to make it about 1/4 of the way. We really liked the Xi’an area! I can’t wait to hear about your cruise. I just found your blog through cruise critic and I love it – what an amazing trip! Thanks for your “love”, Jill. Nice to know people are actually reading it.